All songs by Donovan P. Leitch, except 01 by Shawn Phillips, 02 by Woody Guthrie, 06 by Aaron Zeitlin, Sholom Secunda, Arthur S. Kevess, Teddi Schwartz and 08 by Buffy Sainte-Marie. 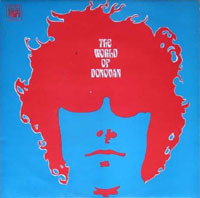 · Another album with the same title, The World Of Donovan, was released by Epic Records in the USA in 1972. · The back cover has a black and white picture of Donovan at the Bodiam Castle, taken by Karl Ferris for the A Gift From A Flower To A Garden photo session. · The Little Tin Soldier is listed as Little Tin Soldier on the back cover, but is correctly listed on the record label. · Riding In My Car (The Car Song) is listed as Car Car on the back cover. On the record label it's credited to A. Guthrie. · On the record label Donna Donna is credited to S. Segunda.